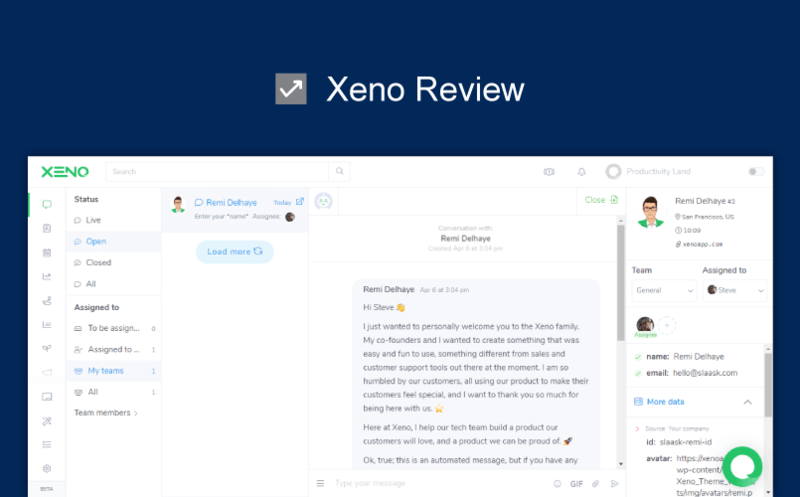 I review Xeno, a new live chat software that offers everything to manage your visitor/customer conversations better. Live chat, Helpdesk, Knowledge Base, News Feed, Chatbots, etc. All these elements come together to provide a complete customer support channel for digital brands today. And while there are different tools catering to a specific need, there are only a few tools bringing all these together in one robust platform. One such live chat and customer support software is Xeno. I found out about Xeno and its features earlier last month. Although the tool is still in Beta, and it is fairly new, Xeno seemed like a powerful tool and I decided to check it out. In this Xeno review, we will talk about all of its features, functionalities and other important details about the platform. Let’s get started. Suited for all kinds of support teams (2-500 members). Unlike other live chat and helpdesk software, Xeno is free of cost. Users only pay to reflect their brand in customers’ eyes, by customizing their chat box. Xeno’s chat box is multilingual, providing support in over 50 languages. We also offer a free Auto-translate feature to all our users, enabling them to interact with anyone, anywhere in the world. Xeno is tightly focused on good design and serves the needs of end visitors and the admins together. The customer view is quite easy on the eyes especially the live chat itself making it quite user-friendly. With so much competition in the online chat and customer engagement space, there’s little to set Xeno apart from the most popular apps in the market. What I loved the most about Xeno was its admin panel and how well thought-out the dashboard and agent screens are. We all know, good customer support is as important as the product itself hence giving your agents the power and ability to execute conversations seamlessly is the key. The right panel shows details about the user and device along with other widgets making all the important information readily available to the agents in real-time. If I have to sum up my experience of Xeno, I found it to be quite simple, intuitive and clean. The only improvement I could think of that could further improve the design would be the ability to apply different skins in the admin panel. Adding a little contrast would do wonders to my focus and concentration as opposed to the all-white background. When asked about the design philosophy, here’s what Team Xeno had to say. We try to implement the very best user experience possible, as we believe UX is key. Also, we believe in simplicity even if we need to deport the complexity to our side, in order to keep everything as simple as possible for our users. In a nutshell, considering the simplicity in user experience and good design, Xeno is definitely worth a try if you’re looking for better engagement from the website or the application itself. With Xeno, you get everything you need to assist your visitors, from the very first time they land on your website to the very last until they convert and become a customer. There are pre-chat messages that allow you to send promos and exciting offers to your visitors. You can conduct useful surveys that only take a click and won’t waste your visitor’s time. There is a chatbot ready to assist your visitors when your support team is not online. You can integrate Xeno with various other apps, including Airtable, Jira, Freshdesk, HubSpot, Pipedrive, Salesforce, Mailchimp, Zapier, and more. I counted more than 50 integrations available. Let’s deep-dive into Xeno’s features one by one. Soon as you complete the sign up and onboarding for Xeno, you land at their Conversations page. This is the primary page where most of your support team will be spending their time. On the Conversations page, you see all the chats and messages that are sent in by a customer/visitor and all that are replied by your team. Let’s give you a walkthrough of the screen. On the left-hand side is the main app navigation panel. It contains icons for all the different pages in the Xeno app. Conversations, Contacts, Meetings, News Feed, etc. are all present here. The navigation panel is minimized to give more real estate to the rest of the page. Once you hover over it, the panel expands. You can also disable auto-minimize by clicking the Expand button at the bottom. Next, you have all the Conversations listed down for you to quickly access. On the right, you have the conversation preview box. This is where you can read the entire conversation history, and respond to your customers/visitors. You can use emojis, add GIFs, and attach files along with your messages. On the top of the preview box lies the Mark as Closed button. Soon as the conversation is resolved or has ended, you can click the button and the conversation will be moved to the Closed conversations page. On the extreme right-hand side is the user/visitor/customer information. Their name, location, the team and support team member they are assigned to, and other details regarding their OS, browser and IP are all laid here. Next up in my Xeno review – the Contacts page. This is where all the contacts associated with your conversations are placed, so you can easily find them and send them a message later if you want. The contacts page does not have a lot of features and options to explore through – everything is pretty standard here. There are two types of contacts – Leads and Known Contacts. There is also a contact unique identifier number given to each new contact. However, I’m not sure what it does. I tried searching for my contact using the unique identifier number, but the search bar had no results to display. I could also not find a way to export your contacts from Xeno into a CSV file or an Excel spreadsheet. Another great feature that comes with Xeno is team meetings. During conversations, if you’d like to schedule a demo, a presentation, a phone call or any other kind of appointment with your visitor/customer, you can do so by sending a meeting request. The visitor/customer will then accept your request for a meeting and the scheduled meeting will show on the Meetings page in Xeno. 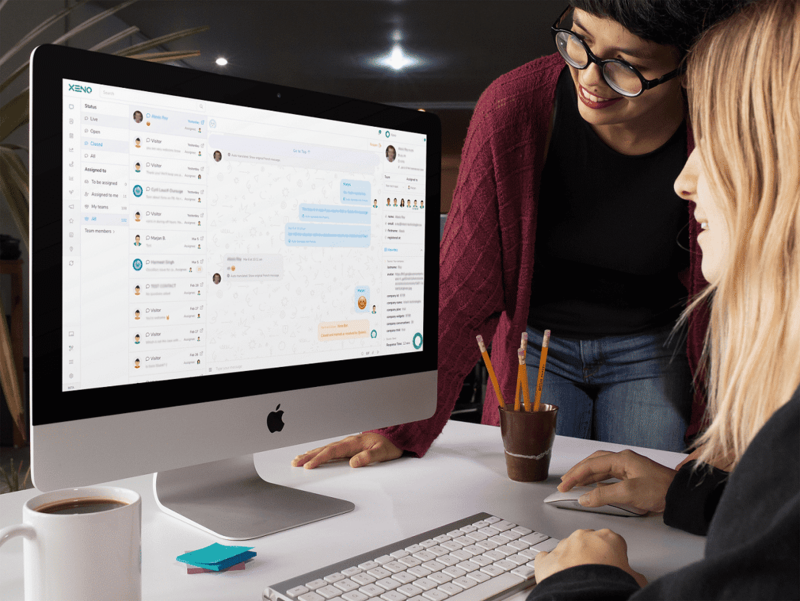 This is a great feature and it avoids the need to juggle between your live chat software and your meeting planner to cater to your customers. Instead, everything is there in one place – their conversations and their scheduled meetings. Xeno offers some standard meeting types that you can schedule with your visitors/customers. If you’d like to create another meeting type, that can be done via the Meetings page in the Xeno app. Meetings in Xeno can also be synced with your Google Calendar. For visitor/customer self-assistance, there are a few features available as a free add-on with Xeno. Often at times, the support team does not need to explain everything in chat, rather redirect inquirers to a specific how-to article or perhaps to the help center. First up in the Auto-Help section, you have your Knowledge Base. 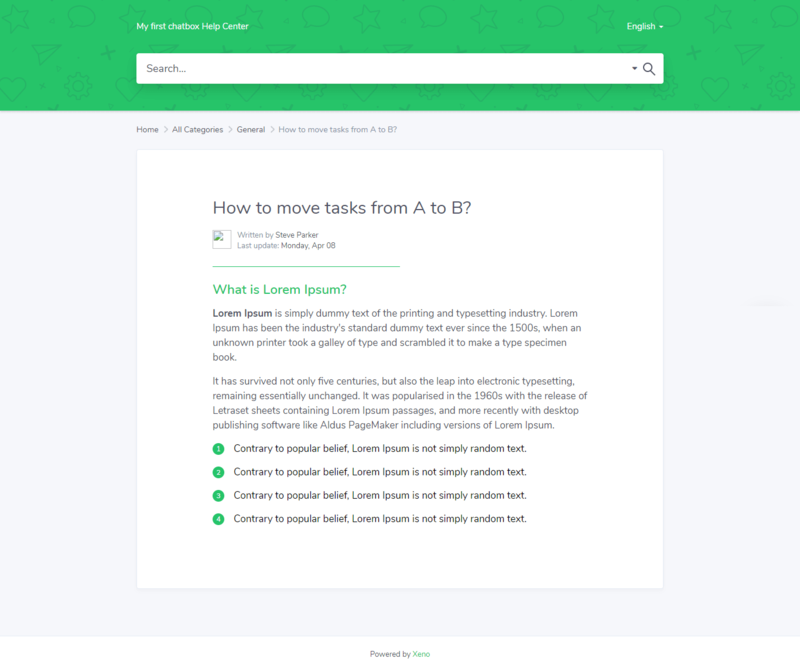 With the Knowledge Base, you can publish self-help, how-to articles, tutorials and walkthroughs. With Xeno, you can upload and attach images and videos to your knowledge base. You can categorize your published articles if you are making an extensive knowledge base portal. There is also the option to save your Knowledge Base items as a pre-defined response which you can then use in your conversations with your customers/visitors. Using the Help Center page, you can configure the URL and map the subdomain to your Xeno Help Center. You can then use this subdomain URL to redirect your visitors/customers to your help center. Using the Bot Analytics dashboard, you can get a quick summary of all the queries that your visitors/customer run to find relevant information from your help center. It shows the top searches, as well as the top not-found searches which, in my opinion, are an excellent addition. These top not-found searches can greatly help you understand what your customers/visitors most search for and are unable to find, which you can then cater to by publishing more relevant, keyword-specific information on your help center. You can route incoming conversations to different teams based on the nature of queries by using Xeno’s routing features. You can create multiple sub-teams in Xeno, and then assign incoming conversations to these sub-teams. This way, your visitors/customers do not have to wait to be passed around from one support team member to another. Instead, assign a sub-team directly responsible for handling the nature of query and close conversations faster. Adding two more great features to the list – Timetables and Days Off. With timetables in Xeno, you can automate what time Xeno support will be live and at what time your chat bot will entertain incoming conversations. You can account for break times, half days, team events, etc. With Days Off, you can account for any days that your team might not be available. This will then put Xeno in Delayed mode for the day you marked off. Smart, isn’t it? With the Analytics dashboard, you get a comprehensive view of all incoming conversations, the time it took to respond and how many of them are still pending a response from the team. I really liked the intuitiveness of the Analytics page, and the graph looks beautifully designed. Oh, and there are three graph types available – Pie Chart, Bar Chart and Line Chart (shown below). 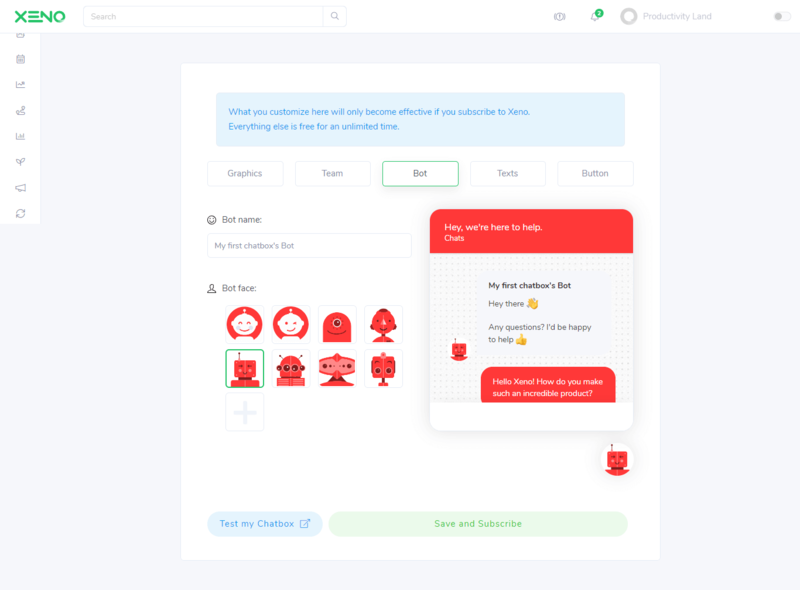 There is also a graph for your chat bot and its conversations, and a KPIs graph to see how well your customer support team is doing to maintain set goals and benchmarks. The News Feed is just like your Knowledge Base, except it is for news, updates and important announcements. The dashboard is the same – you can add text, media and categories, and then publish your news items in the News Feed, which can then be accessed publicly using your Help Center. For automation, Xeno also introduces auto-messages, that can be sent for your customers/visitors to interact with. You can create surveys, send triggered messages, or pre-chat messages that can give more context to your conversation. The surveys are easy to create and set up with just a few clicks. You can also view the answers for each of your surveys by clicking the Actions dropdown button and selecting Responses. I really liked triggered messages in Xeno. They have a lot of trigger conditions to choose from. Starting from basic information such as Name and Email all the way down to UTM source, medium and content – you can set up triggered messages based on anything. These triggered messages can then help personalize conversations for your visitors/customers coming from a specific traffic source. You can also ask your visitors/customers some pre-chat questions so they can provide you the necessary information before a support team member begins to chat with them. These include name, email and an open-ended question with a short text answer. You can integrate a number of apps with Xeno. The Apps page is like a mini app marketplace inside of Xeno. I was surprised to find out Xeno supports over 50 app integrations. These integrations are divided in 13 categories, including Analytics, Project Management, Ticketing and Payments. For deploying your chat box powered by Xeno, you can use a range of possibilities. If you’re deploying Xeno on your website, you can use their plugin for Shopify or WordPress, or simply inject their smart code in the body tag. Xeno can also connect with your email. Simply update your CNAME records in your DNS manager and route all emails sent your way to Xeno. Furthermore, you can connect Xeno with Facebook and Twitter, or even with your phone via SMS. Any new messages and conversations will be sent you via SMS while you’re on the go and you can respond to them if you’d like, simply by replying to the SMS. Xeno also has SDKs available for both iOS and Android. If you’d like to deploy the Xeno chat box in your apps, you can do so by using these SDKs. Last but not the least, Xeno generates a public and a private brand key. All the app integrations we talked about earlier as well as the deployments work with these keys. Xeno provides you with customization options to make your chat box yours. However, customization in Xeno is a paid feature and starts at $34 per month. You can customize things such as your team’s name, team avatar, chatbot name, chatbot avatar, chat box color, messages and more. The Home screen page is where you can add or remove elements from your support portal as well as your chat box. Two wonderful additions – Statuspage and Product Hunt cards. If you’re launching something new on Product Hunt, you can use the Product Hunt card on Xeno to spread awareness using your chat box to all incoming traffic. That Statuspage card can provide health status and outage reports for your customers/visitors so your team won’t have to respond to conversations each time a service is temporarily down. Xeno offers 7 day trial on all paid plans. Xeno takes necessary steps to ensure your data is safe and always available. All data processed is encrypted (HTTPS). Data export and deletion at customers’ request. Xeno has a dedicated support portal for its customers to submit any tickets or queries which are responded to in a timely manner. Below are a few support options available. 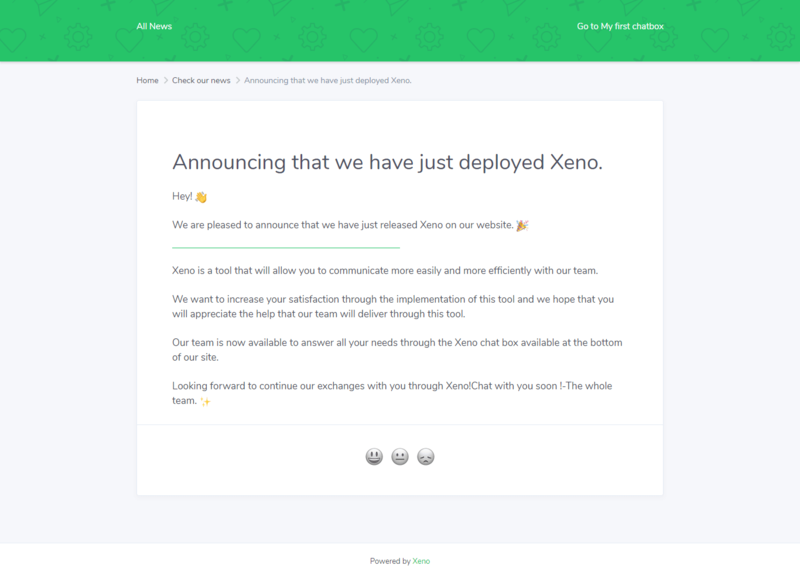 Live Chat: Xeno has a very active live chat support available on the website which is always available to help you get started or resolve any issues. Social Media Support: Xeno entertains social media support on Twitter and Facebook along with help tutorials and products information also available on their official blog. For a new live chat software, Xeno does not disappoint. It offers a range of deployment possibilities, has its own plugins for Shopify and WordPress, gives you tons of integrations with your favorite apps, and has powerful features such as routing, auto-messages and auto-help to bring more value to your customers/visitors. I enjoyed reviewing Xeno in depth and I wish the team all the best with their new tool. It has great potential and the Xeno team has done a great job making the platform so seamless and easy to use. What business tools would you like me to review next? Ping me at [email protected] with your ideas and suggestions.